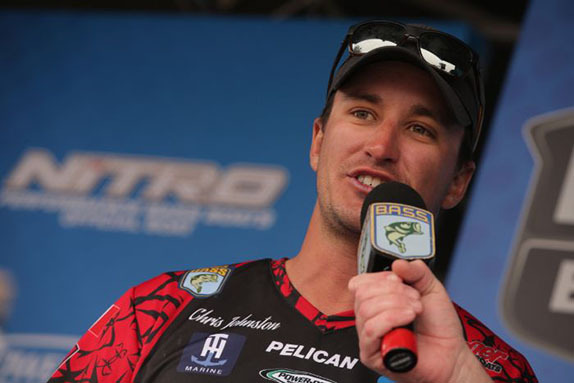 Chris Johnston will take a 5 1/2-pound lead into the final day of the St. Johns River Bassmaster Elite Series. 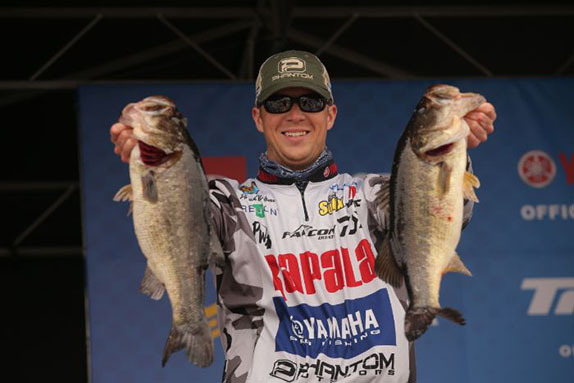 So much for the idea that the gray, cool, windy conditions in Florida would hinder the bite on day 3 of the St. Johns River Bassmaster Elite Series. The action got even hotter as more big females continued to arrive in the shallows for the annual spawning ritual and a bunch of them made a visit to the weigh-in stage. Fourteen of the 35 anglers who'd advanced to the weekend caught at least 20 pounds and three surpassed 30. Clifford Pirch led the way with a tournament-best 34-09 haul that moved him from 22nd place to 5th. 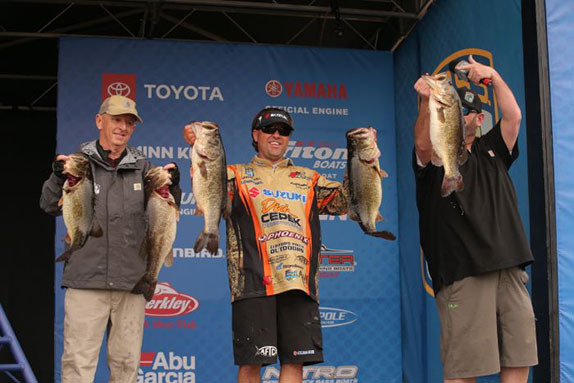 Canada's Chris Johnston stayed in the lead with a 28-13 stringer that pushed his total to 75-13. He's now on pace to crack the 100-pound mark for the event � a feat that would've been deemed highly improbable when the week began. Rookie Patrick Walters boxed 32-15 to climb from 11th to 2nd with a 70-05 aggregate. Veteran Mark Menendez held onto the No. 3 position he's resided at throughout the event with a 23-07 sack for a 69-05 total. Johnston's brother, Cory, moved up one place to 4th with 68-13 (27-13 on day 3). Pirch and his 68-09 total completed the top 5. The remainder of the top 10 consists of Lee Livesay (68-01), Scott Canterbury (66-03), 2016 St. Johns winner Rick Clunn (64-00), day-1 leader Robbie Latuso (63-11) and John Crews (58-10). The vast majority of the 10 anglers who qualified for the final round are plying reeds and dollar pads in the northern portion of Lake George. Sight-fishing wasn't a big factor today with the wind and lack of light, but flipping and blind-casting to the fat lunkers that are new arrivals to the shallow spawning cover has proven to be quite effective. Patrick Walters' 32-15 bag was his personal record for a competition day. The WeatherChannel.com forecast predicts showers, a 72-degree air temperature and a double-digit wind out of the east/northeast for the final day of the derby. Perhaps the full-on frontal conditions will prevent another overnight migration to the bank and give the big Florida females the lockjaw that they're infamous for under such a scenario � or maybe not. Chris Johnston assembled his best stringer of the event despite being outfished in his primary area by a guide boat offering up live shiner minnows. An 8-pounder was his biggest specimen. "A huge wave (of spawners) moved up last night or early today and the fishing was pretty crazy," he said. "It wasn't like this in practice, that's for sure." He's trying to win a Florida top-level event in February for the second straight year � he prevailed at the FLW Tour stop at the Harris Chain 12 months ago. "I'm not as confident as I'd like to be just because that spot has gotten so much pressure, but I'm doing the same thing everybody else is, so I should be able to catch some tomorrow. I've got four areas where I'm running the same pattern and I'll hit all of those. I just need two or three big bites. "I think it might slow down a little � there will be good bags caught tomorrow, but maybe not quite as good as today. I don't think a bunch more fish will be moving up, but I could be wrong and I hope I am." Walters, the winner of last year's Bassmaster Central Open at the Red River, set his personal best for a competition bag with a stringer that was an ounce shy of 33 pounds. It was headed up by a 9 1/2-pounder and the smallest he weighed was a 4 1/2. "I caught the biggest one on a spinnerbait, but other than that I'm just flipping reeds and buggy-whips," he said. "I believe they're spawning, but I'm just fan-casting each area I pull up to." Clifford Pirch's 34-09 stringer moved him up 17 places in the standings and got him another day on the water. He lost a 7-pounder right at the boat that would've put him over 35 pounds for the day. "I'll stick to the game plan tomorrow and run a bunch of new water. I just have to make sure I don't fish too fast." Menendez only had four fish when the afternoon rolled around, but caught a 5-pounder and a 6 on back-to-back throws. The latter replaced a 1 1/2-pounder in his livewell. "I didn't catch them out deeper like I had been, so I had to get up on the bank and pick up a spinnerbait," he said. "It was old-school stuff. I'm not getting a lot of bites, but when I do get one it's usually a quality fish." Cory Johnston, like his brother, amassed most of his weight during the early part of the day. He ended up with three fish that weighed more than 6 pounds apiece. "I never did get a true giant like some other guys did," he said. "They were all just real solid fish. "I lost a great big one at the end of the day, right where I caught my last big one. I caught a glimpse of her, but I couldn't even budge her." An 8-12 bruiser was the heaviest fish in Pirch's massive bag, which was 3 pounds shy of his personal best (37-08 from Clear Lake in California). "I had to do some different things and cover a little more water than I have been," he said. "I fished moving (baits) quite a bit just because we had that kind of weather." Can he back it up with another big haul on day 4? "This is the kind of place where you can sure do it and there were a lot of great bags caught today. The chances are better than average, but at the same time these waves of fish turn over fast, from male to female to big to small to biting to not biting. Everything happens quickly. "I'm comfortable going a different route than I did today. We'll just have to see what happens." > Day 3 stats � 35 anglers, 28 limits, 3 fours, 1 three, 2 twos, 1 one.